Place onion in the bottom of a Crockpot. Cut each slab into 5 portions of about 3-4 ribs each. Place ribs on top of the onions. Cover with lid and cook on low for 5-7 hours. At that time, remove the ribs into a bowl and discard the onions and any liquid. Rinse the Crockpot if necessary. Return the ribs to the crock pot and pour BBQ sauce over ribs. Use a pastry or BBQ brush to brush the sauce over the top and bottom of each rib. Continue to cook on low for 2-3 hours or on high for 1-2 hours. These times are approximate and can be modified to fit your schedule. 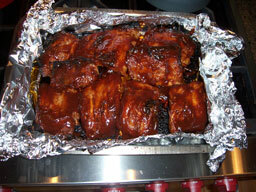 After the ribs are cooked in the sauce they are ready to be served. If you prefer, the ribs can be browned by placing on the grill or under the broiler for 2-3 minutes per side while basting with sauce. Reheating tip: Refrigerated leftovers or ribs made in advance can be reheated in the oven at 350 for 25 minutes. If you want to serve ribs for a party or a large group of people, this reheating method works great. My kids think they taste even better when they are reheated with additional sauce on top. 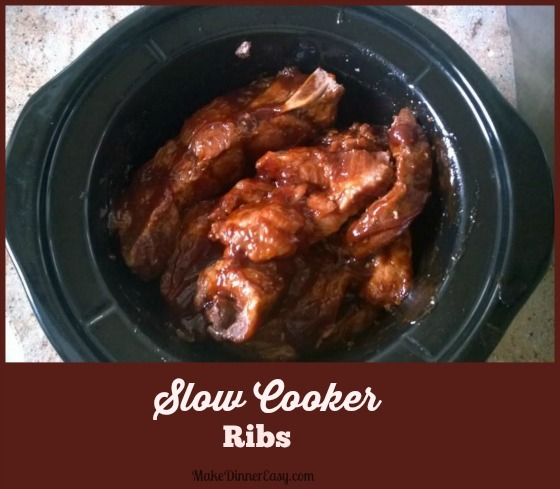 If you don't have a slow cooker, check out this recipe for Oven Braised Ribs!